One of the hangups that keeps people from starting is a concern about safety. Our evidence-based system scales to meet a person exactly where they’re at, so they can progress without risk of injury. We’ve got that covered! Another concern is lack of progress. While it is true that aging comes with a loss of strength and function, a large portion of this is the result of sedentary behavior. 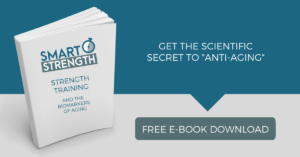 Resistance training produces improvements in strength, lean tissue, and bone at any age! Our aforementioned most senior client, Grace, has made tremendous strides since she started training with Smart Strength. Don’t take my word for it; look at her results! What you’re looking at is her strength improvement in her legs over the past 6 months. 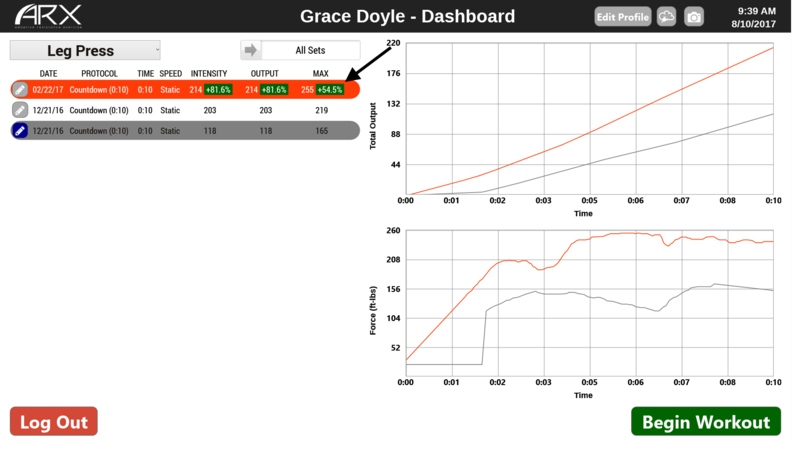 She’s more than 50% stronger (look where the arrow is pointing), training 22 minutes once per week! We test strength every 8 to 12 weeks to ensure that our protocols are producing real results. It’s never too late to start, but you’re a lot better off the earlier you start!